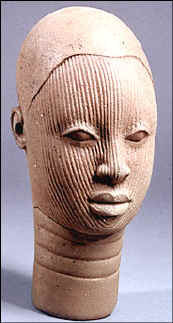 Genesis: Ideas of Origin in African Sculpture. SCHEDULING shows at the Metropolitan Museum is like regulating airline takeoffs at Thanksgiving. The queue is long; establishing priorities is a delicate business; the competition for prime runway space is fierce. The museum's curators of African art have sidestepped all the fuss in "Genesis: Ideas of Origin in African Sculpture." Rather than wait for one of the deluxe showcase galleries to be free, they've cleared out a piece of their home turf, the Michael C. Rockefeller Wing, and mounted the splendid if compact show there. Even with Daniel Kershaw's ingeniously permeable installation, the space feels small for so large an art. But I always feel this way about African art in museums; to me it looks uncontainable, irrepressible, pressurized to the point of explosion. The impression comes from the physicality of work that is constantly reaching out and pulling in, opening and closing, contrasting light and dark, rough and smooth. It is also a product of conceptual activity that is practical, radical and nonstop. A Yoruba terra-cotta head (12th to 14th century) from "Genesis: Ideas of Origin in African Sculpture" at the Met. A 38 1/2 inches high male antelope headdress of the Bamana people in Mali. ¶It proposes rigorously ethical models for political leadership and a universal etiquette of patience and self-restraint. ¶It promotes physical and psychological healing and establishes diplomatic ties with the afterlife. ¶For the average person, it shapes a stimulating vision of the here and now by inventing forms that don't exist and reflecting forms that do, so that everyday life feels both exotic and reassuringly familiar. ¶Through an exercise of immense wit — no art is more entertaining — and moral gravity, it records history, the record of where we came from and where we may be going. History is the theme of the show, which has been organized by Alisa LaGamma, an associate curator at the museum. Divided into four sections, the first on the creation of the world and mankind, it opens with a heart-melting sight in the form of an eight-inch-tall terra-cotta head of a young woman, made between the 12th and 14th centuries in the city of Ile-Ife in what is now Nigeria. According to Yoruba myth, Ile-Ife was the birthplace of the first humans, black and white, who were sculptured from clay by the artist-god Obatala, or by the supreme creator Oduduwa, who fashioned the continents. Either would have been proud of modeling this young woman's comely face, scored with undulant lines like flowing water and glowing with serene self-confidence. To the same degree that early Nigerian naturalism falls comfortably on the Western eye, the Adam and Eve figures carved from wood by a Senufo sculptor in Ivory Coast or Mali present challenges and excitements. Nearly four feet tall with broad shoulders and wedge-shaped heads, their bodies taut with held-in energy, their skin glowing as if filled with sap, they are tremendous and tender things, complementary emblems of the difference-in-sameness balance that keeps the universe in motion. Once human beings arrived on earth, power politics inevitably followed, and explanations of how government, enlightened or otherwise, came to be is the subject of the show's next section. The story told by the ceremonial masks of the Kuba people of Congo includes an incestuous romance. One mask, encrusted with cowrie shells, represents the first Kuba king. Another personifies his sister, by whom he had children. She is depicted with a strip of beadwork covering her mouth like a seal and her cheeks streaked with painted lines that might be tears. Luba kingship, by contrast, had more decorous origins. It began with the appearance of a foreign hunter-prince, the young and dashing Mbidi Kiluwe, who established order in an unruly world and whose son, Kalala Ilunga, initiated a dynastic line. To reaffirm this lineage, each new ruler is equipped with a set of ceremonial objects modeled on Kalala Ilunga's, including a staff of office, a bow stand, an abstract map of Luba history known as a memory board and a divination bowl. The bowl at the Met is attributed to the so-called Buli Master, a 19th-century artist who was the subject of the first special exhibition organized in the Rockefeller wing, in 1980. It is carved in the shape of a woman holding a hollowed-out calabash to be filled with objects used to extract information from the spirit world. With her grave, downcast face and her body curved over the bowl as if to protect it, she makes a stirring figure, not only as a brilliantly realized sculpture but also, as Ms. LaGamma writes in her exhibition catalog, as a "profound commentary on the human spirit's desire to obtain knowledge and influence the course of history." Family genealogy is also preserved and celebrated through art. For the Fang people of Cameroon, the reverence for lineage focuses on the bones and ashes of forebears. Thought to insure fertility and the safe birth of children, the relics are kept in special containers and guarded by carved ancestor figures with pudgy, infantile bodies and vigilant adult faces. The Baga people of Guinea express clan or family identity through masks and headdresses based on stylized, hyperbolic animal, bird and insect forms. A butterfly mask has an eight-foot wing span; two very different masks represent serpents, one as tall as a tree and as thin as a spear, the other a thick, sinuously curving column patterned with Harlequin-like black, red and white diamonds. Together they suggest an intense but objective intimacy with the natural world, of the kind hinted at by the social anthropologist Claude Lévi-Strauss when he described finding answers to the most complex existential questions in "the brief glance, heavy with patience, serenity and mutual forgiveness that, through some involuntary understanding, one can sometimes exchange with a cat." This sense of identification, or connectedness, is highly developed in the carved Ci Wara antelope headdresses of the Bamana people of Mali. This sculptural type has long been an emblem for African art and culture internationally. Mali's national airline uses it as a logo. The 40 examples gathered from American collections for the Met show add up to an optical coup de théâtre, as a similar ensemble did in "Bamana: The Art of Existence in Mali" at the Museum for African Art last year. The revelation in that earlier exhibition, re-emphasized at the Met, lay not in how consistent a particular form could remain through many repetitions but in how inventive it could be. Ci Wara is the name of the mythical Bamana hero who introduced agriculture and gave humans a knowledge of plants and animals. It is also the name of the agricultural fraternity that stages masked performances in his honor, and finally of the masks or headdresses themselves, which are composite images of several animals, including antelopes, anteaters and birds. The show has textbook examples of the sculpture, including male and female pairs. With their squat bodies, beaklike snouts and tapering horns, they share basic features, though the male is distinguished by his windblown mane and the female by the fawn she carries on her back. The variations on these classic types and on the subgenre of horizontally oriented headdresses called n'gonzon koun are astonishing: stripped-down or elaborate, realistic or abstract, changing from place to place, artist to artist. In some cases, the shape is dictated by whether a headdress is created for religious ceremonies or popular entertainment, though often forms and functions are interchangeable. The Met's installation thrillingly conveys the virtuosity in just this one example of the countless types of sub-Saharan sculpture. What the show cannot do, of course, is fully convey the kinetic dimension of this performance-based art, which is fundamental to how it was imagined and how it appeared to its intended audience. This is a recurrent issue with museum displays of objects that do not neatly correspond to the Western concepts of art. And while we may have grown tired of revisiting the problem, it remains important, a matter of seeing clearly. Like the bronze temple figures of Hindu gods from South India, displayed in the Met's Asian galleries and assembled en masse in a glorious show at the Arthur M. Sackler Gallery in Washington this fall, the Ci Wara sculptures achieve their ultimate meaning in movement and as part of a dynamic environment. In public processions, the Indian images exchange glances with their devotees; this interaction gives them life. When the Ci Wara headdresses are worn by acrobatic singers and dancers, the sculptures as much as the performers are seen as vivacious. Ms. LaGamma, thoroughly alert to all of this, has included a fascinating compilation of filmed Ci Wara performances in the exhibition, many of them shot by the art historian and collector Pascal James Imperato. They are given far more prominence than in any Met show I have seen before, and this is good. They may be no substitute for being there when an organic, process-based form of African art is danced to completion, but they are just the right finishing, amplifying touch to an economically executed, grandly conceived show. Build Your Dream Collection ! I never thought I would receive so much information's about the African art world ! 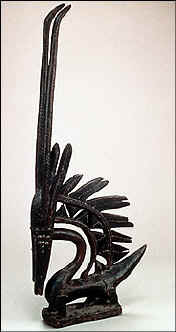 African Antiques is the archive and not growing much anymore but still updated. Visit African Art to join our free newsletter and read recent African Art News. For the last news about african-sculpture you should join our African Art Club and become an insider of the African art market. And if you are a collector of African Art, have a look at our exclusive African Art Collection for sale.